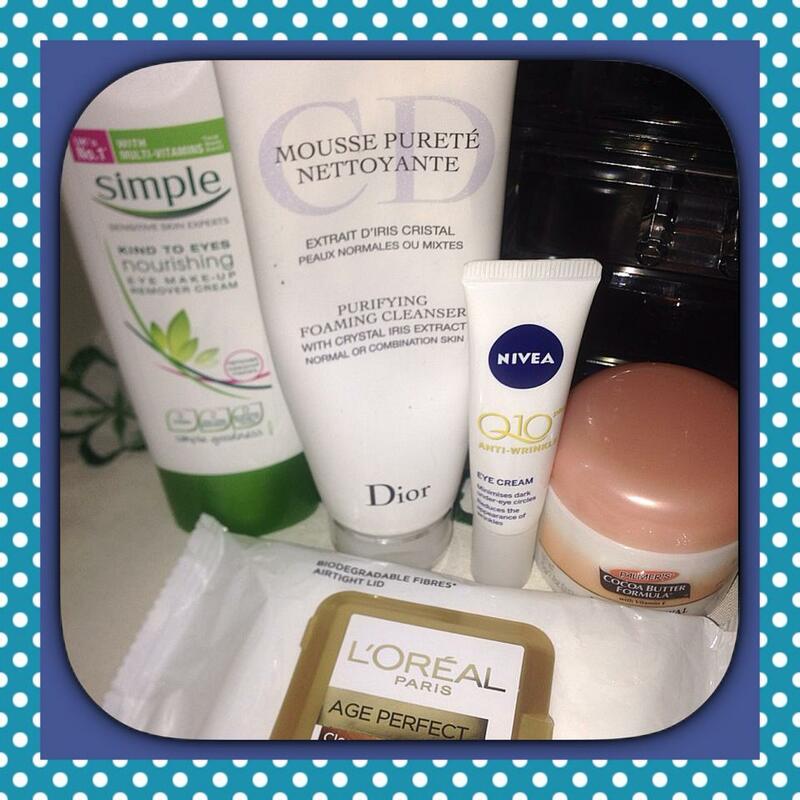 My Evening Face Cleansing Routine..after hitting 30! One of the best feelings in the world is removing make up & then hydrating your skin! When you turn 30, this activity has an element of pressure involved. It is the BIG 30 after all. Three Zero. Thirty! So apart from the daily elements that we encounter, mainly being pollution, hitting 30 signifies the start of serious prevention of dryness,lack of skin elasticity and the dreaded,hated wrinkles. Although some may say prevention should start at an earlier age, I personally and mentally could not get myself to buy an “ANTI-WRINKLE’ product at 25! My mum is a massive anti-wrinkle advocate , I have always seen her with copious amounts of moisturizer on her face, as she reckons dehydration is the first step to WRINKLES! Honestly, she did a great job cause she looks fab for a woman in her 60’s .So when you actually see my mum at home she will look glossy and her face smells so lovely and when I kiss my mum on the cheeks I get a good dose of face cream in my mouth. At least I am moisturising my lips too! However in December 2013 two months before I hit 30, I was in Boots and I thought now is the time. ” Elongate your arm, open you hand and grab the anti-ageing cream”. It was a very painful and rather un-comfy scene, but the first wrinkle prevention cream was purchased and till this day ( 6 months on lol) I still love my Olay Total Effects 7 for the day. The way I cleanse changed slightly at this stage and I need to keep testing more night creams as I am not totally pleased with my current choice. I am also waiting for a facial oil that I would like to implement daily. This routine is a rare occurrence , when I don’t put any make up for the whole day . This is my most used cleansing routine, as its my work make up, I do not use foundation as a base, but a BB Cream or a compact powder. 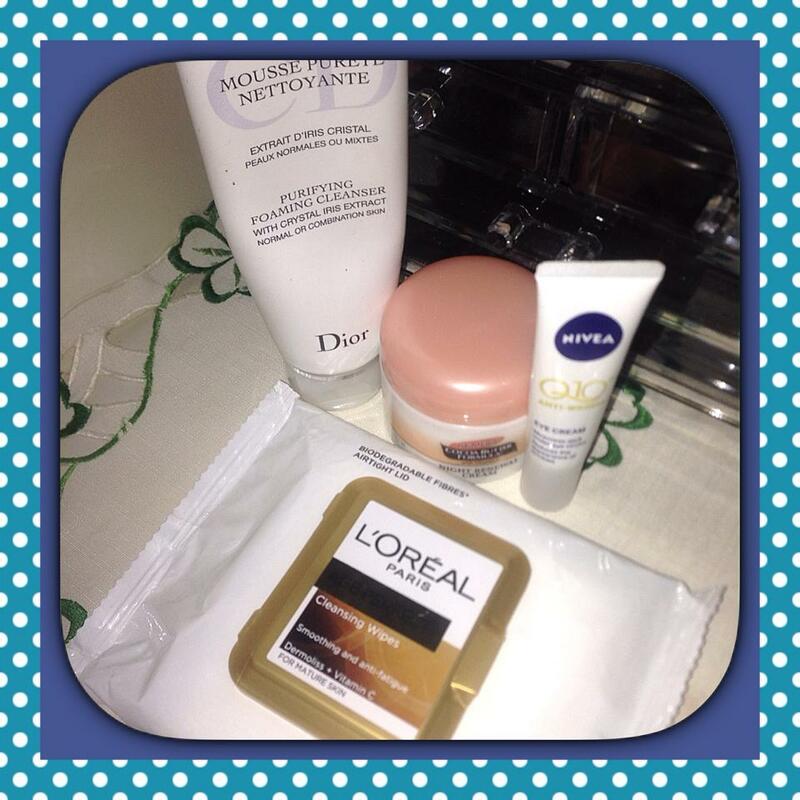 – Clean eyes and face with the L’Oreal age perfect wipes. – Wash face with the Dior Purifying foaming cleanser. – Apply the Palmer’s moisturizer. – Apply Nivea Q 10 eye cream. This is my weekend and going out routine, when I use primers, foundation, highlighters,concealer and all the other make up. – Simple eye make remover. – Wipe all the cleansing lotion, with the L’ Oreal Age Perfect Wipes. – Wash with the Dior Foaming Cleanser. – Then dampen skin and massage the Nivea Gentle exfoliating Scrub for deeper cleansing. 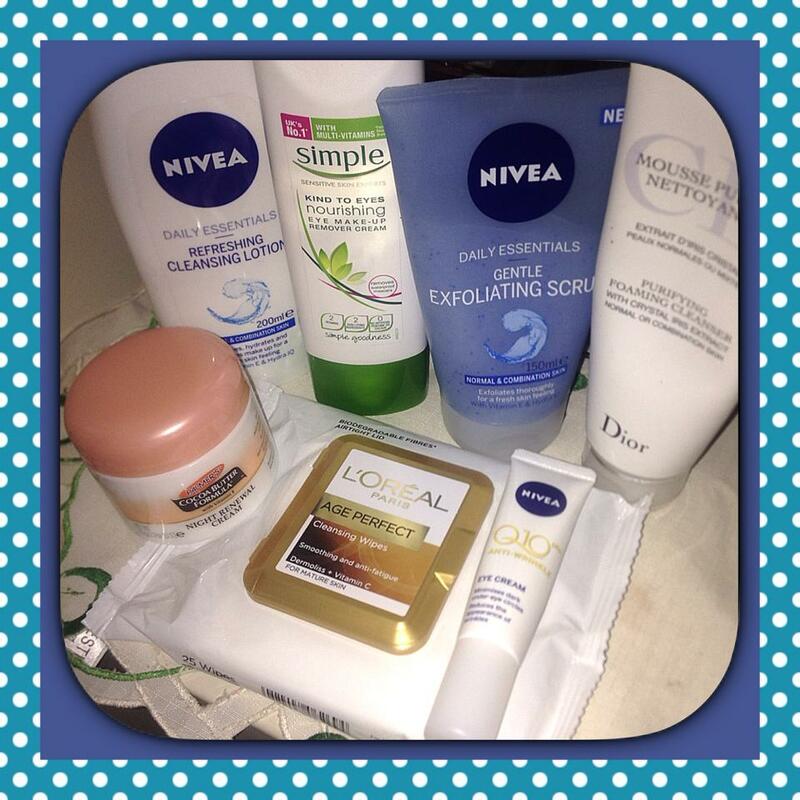 – Moisturise with Palmer’s and finish off with the Nivea Q 10 eye cream. Once a month I do a home facial with some mud packs you find at the pharmacy. And twice a year a professional facial , which is now specifically ant-ageing. The most important thing to keep in mind is that the facial skin is very delicate, so whatever you are going to do needs to be gentle and done with slow movements. Sometimes I leave my skin free for a couple of minutes or an hour before I put moisturizer so it can breath on its own. Drinking lots of water and introducing green tea to your daily hydration routine makes a massive difference to your skin too. Previous Previous post: “Any wish is my command” said EBAY!